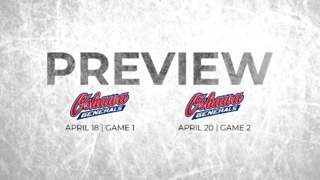 A remarkable, entertaining and redemptive season of Ottawa 67’s hockey came to a close on Sunday afternoon in St. Catharines after a tight 4-3 loss to the Niagara IceDogs. The victory for Niagara gave the IceDogs a clinch in the best-of-seven Ontario Hockey League Eastern Conference quarter-final in six games, and an advance into the conference semi-final against the Oshawa Generals. Playing without captain Travis Konecny due to injury, the 67’s tried valiantly to stay in the game and fought to the end. Twice the IceDogs scored to take a lead and the 67’s responded with equalizers from Dante Salituro and Taylor Davis, who scored his first OHL playoff marker. But Niagara was able to establish a two-goal cushion on goals by Vince Dunn (his sixth of the series) and Brendan Perlini (his fifth) in the middle period. Nevin Guy scored early in the third for Ottawa, but the 67’s couldn’t manage a goal that might have extended the match into sudden-death time. Nathan Todd, the Kemptville native who manufactured an exceptional rookie season, appeared to tie the game in the 13th minute of the third, but the play was reviewed and ruled to have been hit into the net with a high stick. 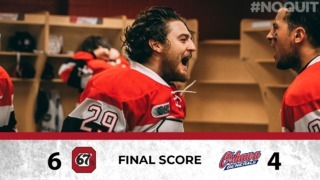 For the 67’s, it’s time to pack things away and head home for the summer after an exceptional 2014-15 campaign which featured a return to the friendly and familiar confines of TD Place (and Lansdowne), 25 victories on home ice and the team’s first appearance in the post-season for three very long years. The 67’s finished fourth in the Eastern Conference, securing home-ice advantage against the IceDogs in the opening round. The series began full of promise for the Barber Poles who won the first two games handily on home ice by scores of 8-5 and 8-3. The IceDogs scored a convincing 6-2 win in the third game, setting up a pivotal fourth game. 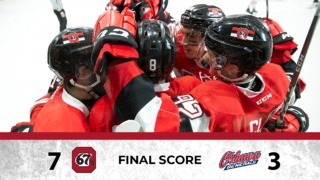 That one went down to the wire, with the 67’s leading until late in the third before the IceDogs tied it, then won in overtime on a Perlini counter to tie the series. The IceDogs took control of the series in the second period of Game 5 at TD Place, scoring three times in the span of less than three minutes in the second to take a 4-1 lead. The 67’s got to within one, but Niagara pulled away in the final period to become the only team in the series to win on enemy ice. IceDogs goals: Jordan Maletta (5), Cody Payne (1). Vince Dunn (6), Brendan Perlini (5). Multi-point games: 67’s: Nevin Guy (1-1), Brendan Bell (0-2), Dante Salituro (1-1).